Our new business website features my beautiful Sacred Space Studio. I’ve been a Licensed Black Belt Nia Practitioner since 2008 and this is my 16th year of teaching Nia (White Belt in 2001, Blue Belt in 2003, Brown Belt in 2006). It has and continues to be my passion for expressing creativity, for moving and dancing, and for opening to the guidance of spirit. Kathy Rink, Licensed White Belt Nia Practitioner also teaches at Sacred Space Studio. Our classes are Saturdays, Mondays and Thursdays at 9 a.m. and Wednesdays at 6 p.m. I also teach Awakening the Tarot: Embodying the Cards classes on Tuesday nights at 6 p.m. This class is a combination of learning the tarot cards, moving/dancing to the energy of the cards and the class ends with a meditation. I offer Reiki healing sessions by appointment and Chakradance Workshops are available twice a year. Life has not always gone in the direction that I’ve wanted, but it’s always led me to exactly where I need to be. I’ve learned and continue to learn to trust the path of life that the Universe has opened up for me. It’s been and awesome journey so far with some unexpected delights along the way. My Reiki client yesterday is a young woman who works in the funeral industry and is the person who, a few years ago, let me know of my gift with Reiki and hands-on healing. Her comment after the session was that she felt it was like a spiritual autopsy. I laughed and told her I had never heard Reiki put in those terms. Yet as she explained her sensation of having had layers pulled back with a spiritually surgical precision, I actually got it. She was able to “see” layers of old “stuff” being cleared away and chakra colors with gold moving in and out likes the waves of an ocean. I’m a visual healer…I see images when giving a Reiki treatment, so I could relate to what she was telling me. Peeling back the layers — that is what the first three months of 2017 has been like for me. The Universe is conducting a spiritual autopsy. Like my friend yesterday, I sense gold flowing through my body — the gold is in the living of spirit in action. How about you? What have the first 3 months of 2017 been like for you? For those who are following my blog…I’ve changed the name of my blog from “Conscious Movement” to Tarot Dancing: Living the Truth of Who I Am. I wanted to better represent this blog with my passion for both Tarot and Dancing. You can still find my blog on WordPress as myjoyfuldance.com. I trust you will continue to follow me! I will be posting about my passions in life: Nia, Tarot, Reiki, Meditation and Chakradance plus my love for my husband, my cats and my world. I was afforded the gift of meeting a remarkable woman on Saturday. I’d say she found me by chance, but there are no chance meetings — life planned this I’m sure, just as life has moved me about like a chess piece making sure I’m in the right place at the right time. Even on those occasions when I manipulated the direction thinking, of course, that life didn’t know what it was doing, I find myself exactly where and with whom I need to be — most of this recognized in hindsight. My intuition however is being honed. It’s actually pretty magical. No, I don’t just sit around waiting for life to tell me what I need to do — I am in action, I’m doing AND being. I remember oh so well my next door neighbor where I grew up coming home from school and announcing “I am a noun verbing.” That was what…50 years ago?…but it stuck with me because she’s right. I am a noun verbing. And I’m rarely disappointed. So this meeting with a remarkable woman…I’m still not quite sure how she found me but she scheduled a Reiki appointment with me. We had only spoken on the phone and then via a text message so I had no idea what she looked like. I had evidently left the front of the office for a moment and when I returned, she was standing at the cash register paying for her Reiki session. The moment she looked up from the cash register I sensed that she and I were connected at some level beyond time and space. I find it curiously exuberant when I recognize spirit incarnate. The Reiki session alone was extraordinary. Afterwards we chatted as I do with all my Reiki clients — about the session, about life and work…yet underneath, around, above and through it all was this intense sensation of familiarity, of connection. We both acknowledged it without much ado. And I think we both left with the certainty that we would meet again. I’ve thought about this connection all weekend. It is a gift that keeps on giving. Three years ago I had an extensive tarot reading done about what was to emerge in 2015 for me. I had it rocking around in my being somewhere that I wanted to blend Nia (a cardiovascular dance and lifestyle practice) with tarot. The guidepost words that came out of that reading were: Dream, Create, Study, Learn, Inquire and Prepare. What better words does one need than those in order to manifest one’s dream? The tarot reading I had done also indicated that 2016 was actually when it would all take place. I am not a patient person. Waiting is not something I do comfortably or easily. When the tarot/Nia blend didn’t immediately happen for me in 2015, I turned my focus to other things — in other words I became distracted from my original intent. So, to make a long story short…in 2016 I stepped in to my dream. I’ve been teaching Nia for 15 years — if you’re not familiar with Nia, check out http://www.nianow.com — my interest in tarot goes way back. In order to read tarot, one must dream, create, study, learn, inquire and prepare. and hat is exactly what I’ve been doing in 2016. I’ve successfully blended Nia and tarot. I bring a reading I’ve done ahead of time into my Tuesday Nia class. I bring enlarged color copies of each card used in the reading that I lay out on the floor in the tarot spread. We discuss the reading. Then we “dance the cards”. I put music to each of the initial 6 tarot cards. I end with a meditation of the chakras. My dream has become a reality for me. By the way, my dream also includes being a Black Belt Nia Practitioner, a Reiki Master Teacher, and my goal before the end of 2016 is to become a Certified Chakradance™ facilitator. So good vibrations can be found at Sacred Space Studio! Nia classes are on Saturdays and Mondays at 9:00 a.m., Wednesdays at 6:00 p.m.; Tarot Tuesdays are on…Tuesdays; Kathy Rink, Certified White Belt Nia Practitioner has a Nia class on Thursdays at 9:00 a.m.
That line has always stuck with me and I believe it to be true about magic. Perhaps we don’t have enough experience in recognizing when magic happens. I believe that people in the our society today have allowed themselves to become numb to the intricacies of magical moments — they’re not finding and/or having any magical moments because they can no longer recognize them…and most people will not come far enough out of their comfort zone to allow magic to happen. Magic has always been a part of my life. From the fairy tales my mom used to tell me to watching cartoons about magic to finally recognizing that it exists with every move I make. My most current magical moment was in realizing that the respiratory cold my body is experiencing is not separate from the shifting consciousness I’m experiencing from my connection and communion with Nia, with Reiki and with Tarot. That which no longer serves me has to move out in order for that which is waiting to serve me to come into place. So I am grateful for what is moving out and for what is moving in. In my last blog post I spoke of the words that had been given to me through spirit: Gratitude and Forgiveness and the six words that have become my creative process were given to me by my Tarot guru (www.thetarotlady.com): Dream, Create, Study, Learn, Inquire and Prepare. My Dream is being created…I’ve already designed a class around dancing Nia to the energy of each of the Major Arcana tarot cards and a workshop designed to delve a little deeper into tarot and movement. I will be studying and learning more about how to best present my dream, I will be inquiring internally and preparing for what comes next. The Empress: “My creativity and abundance are unlimited” and the Knight of Cups: “I bring my innermost dreams to life” are my guides through the process. There is even more being magically placed before me that I am unable to speak about just yet, but I know it’s powerful and I open my arms to what life has to offer. My birthday was Sunday; my body turned 64 years of age. My spirit is eternal. 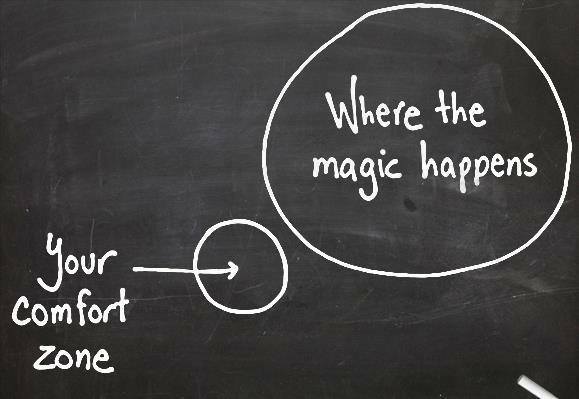 Step out of your comfort zone. Say yes and be blessed. This Sunday I’m teaching my first Reiki I class since receiving my Reiki Master Teacher certification. What an honor. I believe I was born to do this; just as I was born to teach Nia. It’s in the stars. Really. Several years ago (more than 25 years! ), I worked with an astrologist. My chart indicated that leading groups, energy work (Reiki) and creative arts (Nia) were very strong — this would be my direction in life. At that time, I worked for a major corporation (from which I retired after 30 years in 1998). I felt I had no room in my life (at least that’s what I thought) for energy work or dance. Amazingly enough, I managed to fit in Reiki I (1986), Reiki II (1997), took Gabrielle Roth’s 7 Rhythms classes (1983 and 1993) and Eurythmy classes (1996) plus every aerobic fitness class available. It wasn’t until I retired in 1998, moved to Indiana and subsequently to Wisconsin that the direction became apparent. I stepped in to the Nia White Belt Intensive in June of 2001, married my twin flame in July of 2001 and began a journey of consciously moving energy. My Nia practice (13+ years) has been my passion…I love to dance and Nia is conscious movement in the form of a dance exercise fitness fusion. My Nia and Reiki practices are (and have been) a part of the The Nutman Co. USA, Inc. business that my husband and I own. My Reiki practice did not really take off until recently. I attended two Shamanic Journey workshops in March of 2014. From each of the journeys, I discovered that “Reiki Master” was the direction into which I should move. I found a Reiki Master Teacher close to home…one of my best friends and a Nia compadre! The Reiki Master and Reiki Master Teacher classes were exciting, filled with energy and except for my journey with Nia, was one of the best experiences I’ve ever had. So now I get to put into practice my Reiki Master Teacher training. This Sunday, I’m stepping in to moving energy the Reiki way. I am so blessed. Are you a Reiki practitioner? Have you had a Reiki treatment? Do you teach Nia? Have you taken a Nia class?